Yelp is being accused of using its user-review system as leverage to get companies to advertise on its site, where customers rate and comment on stores ranging from hamburger joints to veterinarians. When stories first came out about places that were angry with their status on Yelp, it was easy to think that perhaps these were old-think businesses that didn't realize that the reviews were written by average customers. After all, maybe some of those 2-star shops (out of a possible 5) had been doing shoddy work for years, but there was no way to track there broader reputations before the Web. Tail Wagging The Dog? In a perfect service to irony, the pet shop Wag My Tail is involved in a lawsuit accusing Yelp of playing favorites. But these new lawsuits — filed by a range of businesses in several cities — might suggest a pattern of behavior to some Yelp users that could leave them questioning the information they find on the site. That kind of doubt may be the only thing that could slow Yelp's growth. At the end of 2009, the site claimed more than 26 million unique visitors in the previous 30 days. And it hosts 9 million reviews (and counting). Jeremy Stoppelman, Yelp's CEO, has consistently defended the company from the perception that it plays favorites. He's insisted that Yelp doesn't remove negative reviews in exchange for money. But in a recent blog post, Stoppelman seemed to acknowledge that the company does remove some ratings — to "protect users from fake, or shill, reviews." Could it be that the practice of culling bogus reviews — a necessary step for any site trying to maintain its credibility with an astute group of members — is what creates the impression for some that Yelp tinkers with the overall ratings? Stoppelman seems to think so. He says those who feel wrong are "confused" about how Yelp works. A common theme of the business owners who say they've been wronged is a scenario in which the owner refuses a salesperson's offer to buy an ad slot on Yelp — and soon after, some of the store's positive ratings on the site go missing, they say. As for bad reviews, the owners claim that Yelp offers to shift those to the bottom of the pile — if they advertise. Tech Crunch reports that in the case of Renaissance Furniture Restoration in San Francisco (where Yelp is based), the store's owner claims that he lost 10 of 11 five-star reviews after saying no to an ad rep from Yelp. A recent visit to the store's Yelp page showed it with a 4.5 star rating, based on 3 reviews. Boris Levitt, the store's owner, has filed suit. Last week, law firms from Miami and San Diego filed a federal class-action suit against Yelp over what they call unfair business practices. The lawsuit, as you might guess, has a site of its own. These allegations aren't new — an article last year detailed the shakedown one restaurant owner claims to have gotten from a Yelp employee. As for Levitt's complaint, Tech Crunch has the full text on its site, where it's been following these cases closely. These cases, and the doubts they might bring, could be a real blow to anyone who relies on Yelp to find a good lunch in a strange town, or to see if the new sushi place in their neighborhood is a ripoff — information that I've personally found to be very reliable on Yelp. What makes Yelp useful is its Average Joe quality, mixed with the wisdom of crowds. When I'm using Yelp on my phone to find an awesome cup of coffee, I don't want to wonder whether somebody's got their thumb on the scales. As for the lawsuits, Yelp's Stoppelman says they may be the result of some lawyers looking for a big payday — likely attracted by news of the company's successful rounds of financing. Founded by two former PayPal employees, Yelp has received tens of millions of dollars from venture firms. Still, it won't really surprise many people that Yelp is a different animal from, say, the nonprofit Consumer Reports, known for scrupulously avoiding mixing advertising with its ratings. 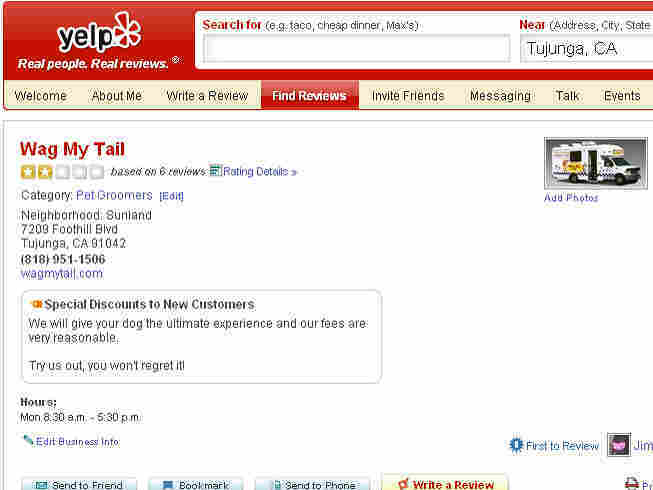 On Yelp, sponsored reviews are often sprinkled into the search results themselves. And that's something you just have to hope most people on the Web are savvy enough to recognize — after all, Google does the same thing with the whole Internet, as Stoppelman wrote in another recent blog post. Whether the complaining business owners' stories about disappearing stars are hokum, or not, the allegations show how hard it can be to maintain trust and credibility — let alone usefulness — when a review site goes from being a startup community to an influential sensation.